In response to growing worldwide demand, Digital Concealment Systems and Schott Performance Fabrics are pleased to announce that in addition to their full range of U.S. produced Berry Amendment compliant A-TACS Camo fabrics, they are now offering a full range of A-TACS Camo fabrics produced off-shore. These fabrics are produced to the same exacting standard as the U.S.-produced fabrics and are made available to international and domestic manufacturers who do not require Berry Amendment compliant goods for their production. Available fabrics include a full compliment of Nylon, Cotton, Poly/Cotton and Polyester goods in a varity of fabric weights and construction. Many international manufacturers of A-TACS Camo products now have the option to source their fabrics ‘closer to the cutter’. This will allow for shorter lead times and significantly lower fabric costs. It also affords significant savings on international shipping and material costs for the end gear manufacturer. This new option also benefits European and Asian manufacturers who sell in non-military channels. Now they have the option to source GENUINE A-TACS Camo fabrics at a lower cost. This option also benefits many smaller manufacturers, especially with low minimum order requirements on fabric--and it will replace the poorly made, poorly constructed counterfeit fabric that is currently on the market. Counterfeit camouflage fabrics have been a problem for every major camouflage brand since the beginnings of the industry. Cheaply and poorly produced overseas pattern knock-offs are a continuing issue for everyone from Crye Precision, to the US Goverment, to us here at DCS. Each time a counterfeiter is pursued through legal channels, a new one pops up, perpetuating the problem. This new fabric option will allow manufacturers currently engaged in producing A-TACS Camo gear using poor quality counterfeit fabrics the option to switch over and begin using legitimately produced A-TACS Camo fabrics. 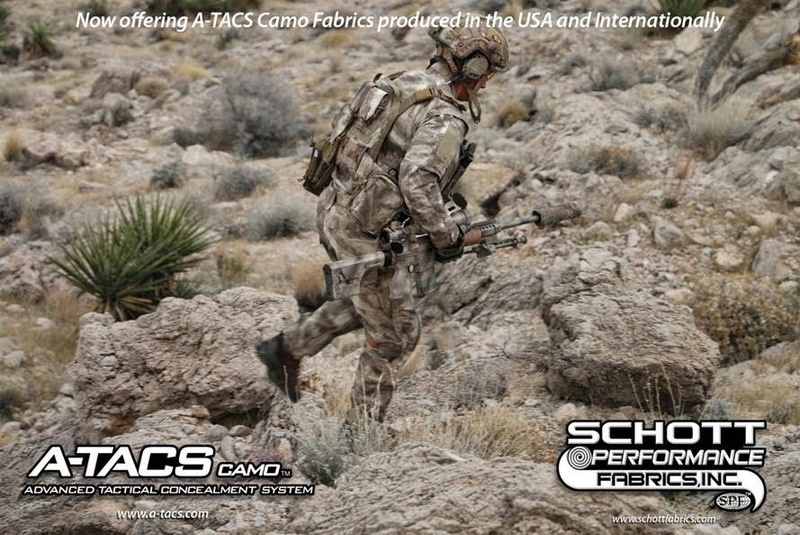 Schott Performance Fabrics is the ONLY legitimate source for genuine A-TACS Camo fabrics. If the fabric was purchased from anywhere else, it is the product of a counterfeiter. In the coming months, Digital Concealment Systems will be ramping up it’s legal pursuit of both manufactures and retailers engaged in the production and sale of counterfeit items in A-TACS Camo. Additionally, DCS will also be calling out manufacturers and retailers dealing in and manufacturing counterfeit A-TACS Camo gear. For additional information, sourcing questions and availability, contact Denise Barrick dbarrick@schottfabrics.com or Bryan Merrick bmerrick@schottfabrics.com at Schott Performance Fabrics (330)784-4545 or visit them on the web at www.schottfabrics.com.